VeraCore is an order fulfillment solution that enables e-tailers, 3PL’s, commercial printers, and fulfillment companies to efficiently manage their fulfillment operations. It is a flexible and cost-effective product that combines order management, warehouse management, and business management systems in one complete package. VeraCore Software Solutions Inc. has designed the app specifically for organizations that offer fulfillment and direct marketing services. In fact, VeraCore is created to be at the core of your fulfillment business. It combines a powerful order management system with a robust warehouse management system to help you manage all aspects of the order fulfillment process. 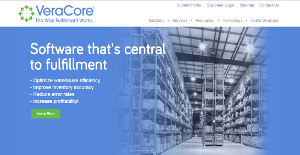 With VeraCore, you can reduce error rates, improve inventory accuracy, optimize warehouse efficiency, and boost profitability. The software is available in cloud-based and on-premise editions. VeraCore’s services include support, training, shopping cart design, and custom programming. This app is used by a host of small and medium-sized companies including Karol Fulfillment, Omnipress, Great Lakes Integrated, Fulfillment Works, and Jet Mail. VeraCore offers a robust capability suite that helps attract more clients and get new revenue streams, while it also improves retention of existing customers. As a matter of fact, the platform is described as a sticky app, where the user can have constant contact with clients, and stay connected with those who’ve already made their purchase. VeraCore is also a modern and regularly updated too, where new capabilities are introduced automatically, and don’t require additional fees and payments. The vendors are devoted to innovation, and do their best to consider real-life business requests from their clients to make the product even better. Another critical benefit to consider is reliable uptime – unlike many similar systems, VeraCore understands the importance of customer satisfaction, and aims to deliver nothing but intuitive navigation and high availability. It combines core fulfillment and business management features and solutions, so that fulfillment providers and direct mailers can complete all of their activities. More specifically, the fulfillment solution covers everything from order capture to picking and packing, and through to shipping, the fulfillment solution, and makes your operations easy and efficient. VeraCore’s tailored management dashboard, inquiries, and online reporting provide clients with real-time critical data to enable them to stay informed. Features include shipping station integration, storefronts and order import, warehouse management, and order management. As for the business management solution, VeraCore understands that direct mail is a complex operation and involves a lot of moving parts. The system simplifies the complexity by offering you useful tools to manage it all. From the initial quote to the final invoice, VeraCore helps you to handle job production and track postage costs. Features include financial management, production control, warehouse management, and project and job management. Each business has its own characteristics, and can need a particular type of Inventory Management Software solution that will be adjusted to their company size, type of clients and employees and even specific niche they support. You should not count on locating a perfect solution that will work for every company no matter what their history is. It may be a good idea to read a few VeraCore reviews first and even then you should remember what the service is supposed to do for your company and your staff. Do you require a simple and intuitive service with just basic functions? Will you actually use the advanced functionalities required by experts and large enterprises? Are there any specific features that are especially practical for the industry you work in? If you ask yourself these questions it will be much easier to get a reliable software that will fit your budget. How Much Does VeraCore Cost? VeraCore in the Cloud: VeraCore’s SaaS edition is available for a nominal one-time setup fee and on-going fees that start from $350 per month, and are proportional to your fulfillment activity. On-premise Developer’s Edition: Larger organizations with IT staff can install the software on their servers. Provide the details of your fulfillment business to the vendor and get information about the implementation cost and ongoing fees. We realize that when you make a decision to buy Sales Software it’s important not only to see how experts evaluate it in their reviews, but also to find out if the real people and companies that buy it are actually satisfied with the product. That’s why we’ve created our behavior-based Customer Satisfaction Algorithm™ that gathers customer reviews, comments and VeraCore reviews across a wide range of social media sites. The data is then presented in an easy to digest form showing how many people had positive and negative experience with VeraCore. With that information at hand you should be equipped to make an informed buying decision that you won’t regret. What are VeraCore pricing details? What integrations are available for VeraCore? If you need more information about VeraCore or you simply have a question let us know what you need and we’ll forward your request directly to the vendor.